I then made sure that both rods were set exactly the same. Don't take for granted that they come ready to go from the factory. 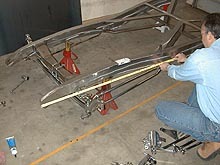 Two reference points were picked on the frame to measure by. This is one of the plusses to starting with a well-made frame like TCI. Both sides were measured and marked and measured again. 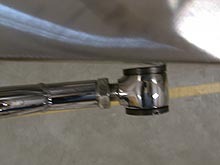 The X member was welded directly behind where we needed to mount the radius rods, so we made sure to mount them just high enough to clear the frame and still allow a nut and washer. 2” longer bolts will be needed. 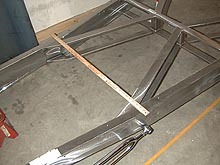 You can see the difference in angles between the frame and radius rods. 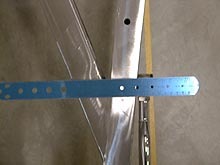 We will drill the holes at a 90-degree angle to the radius rods. 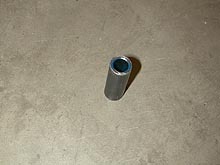 To get the proper angle to drill I set a ruler on top of the rail and marked it in pencil. It just so happens that the lines are parallel to each other, so the radius rods are “square” with one another. I don't think this means a thing but it's maybe worth mentioning. 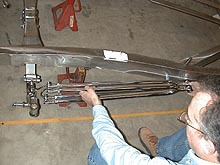 These little 2” long ½” ID x ¾” OD tubes will be inserted and welded in the side rails.